Join us in Leeds for an Evening Wine Tasting at Browns "The Light". Centrally located our regular Weekday Evening Wine Tastings are good fun as well as educational and great value for money too. Not only will you enjoy 7 wines and learn the the key aspects of wine, you will enjoy nourishing nibbles in the form of three starters matched to the wines. We can also host our wine tastings for private groups or corporate wine tastings at various other venues in Leeds. If you are buying this as a gift you can purchase an open-dated gift voucher so that the date can be booked with us after your gift has been received. We'll automatically email you a link to the voucher to print out or we have printed gift vouchers that we can post to you or the gift recipient for £2 (select on check out). 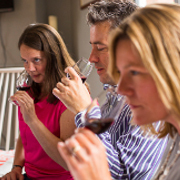 Our evening Leeds wine tastings are both refreshing and fun, but also easy for novice wine drinkers to get a real solid grounding that will help navigate the world of wine with confidence. A selection of antipasti and light snacks are served alongside the wines. In the North West, Frodsham is the closest location to Leeds for our great value weekend wine tasting break. The price is £149 per person based on a twin share and includes a full day tasting wine, Saturday night accommodation, lunch and dinner, with breakfast Sunday morning before checking out. If your booking a single room, there is a Single Room Supplement of £30, please click the link to add the supplement to your basket, or contact us directly to book. Not found what you are looking for? Register your interest in attending a wine tasting event in Leeds by completing the form below.